Temperatures will be near 40 degrees Monday and Tuesday before another substantial warm up. A quiet week is expected for the Finger Lakes, starting cool but ending warm. 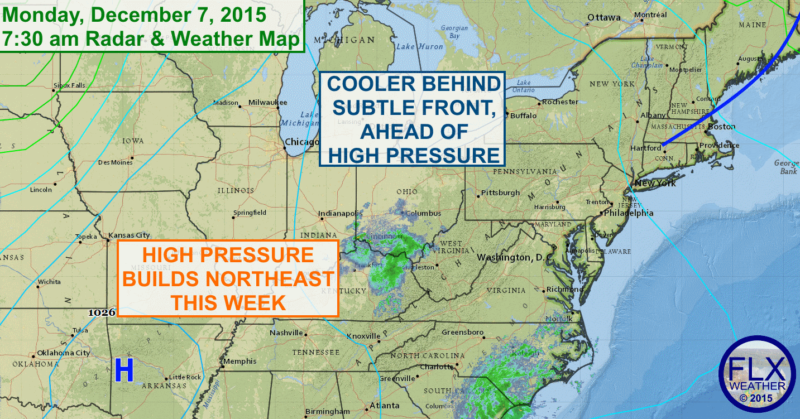 High pressure will build northeast from the southern Plains early this week. Winds ahead of the high pressure are more northerly than in recent days. Combined with a subtle cold front sliding across New England, temperatures will be much closer to normal for a day or two. Expect high temperatures within a couple degrees on either side of 40 both Monday and Tuesday. No precipitation is expected, but the sun will be in and out of periods of clouds. By Wednesday, the high pressure will be centered to our east, just off the coast of New England. This will put winds back to a southerly direction, and the temperature will start to respond accordingly. High temperatures on Wednesday should be well into the 40s. Much of the region will flirt with 50 degrees by Thursday, with highs well into the 50s for Friday and the weekend. Precipitation will be hard to come by this week, with just a few scattered showers Thursday, Friday and during the weekend. None of these days look overly rainy, and some areas may not see any rain this week. No substantial change in the weather pattern should be expected until late December at the very soonest.